I love good before and after pics. If you haven’t noticed, my version of home improvement tends to involve ripping everything down to the studs and rebuilding it from scratch. But it has finally occurred to me that’s not always the best option. Sometimes the projects have to be quick and dirty. We have a super creepy basement bathroom. It was added by the previous owners, but never fully completed. The grout was falling apart, the corner seams in the tile were unfinished, the walls were barely primed, and no matter how hard I would scrub it down, it still looked disgusting. Frankly speaking, when we get around to finishing the basement this bathroom will eventually get torn apart (and turned into something super fabulous) but for the time being I just want it to look passable. 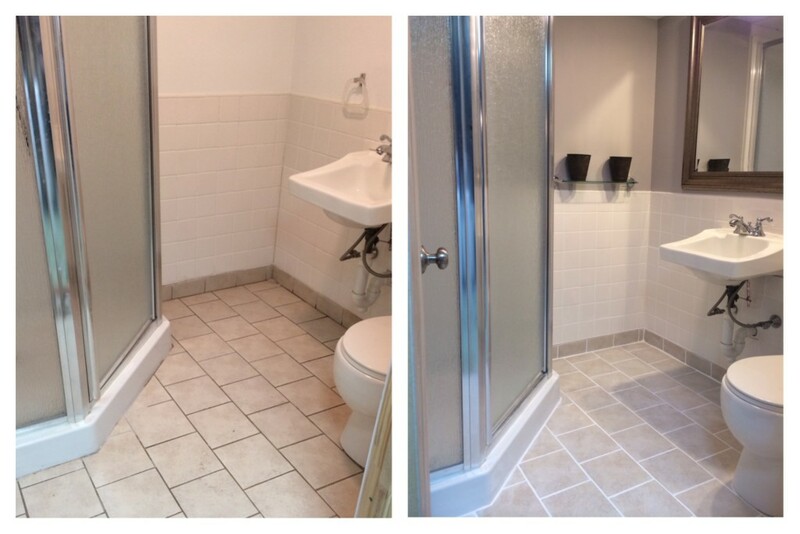 To keep the basement bathroom cost down, it just needed a little TLC… And by TLC I mostly mean new grout. This project was only $50 and lots of elbow grease, but it was totally worth it. Even though this is like putting a silk hat on a pig, it finally feels clean! I’m telling you… When in doubt- regrout! 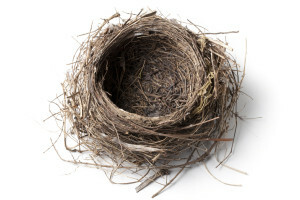 Allow me to geek-out of just a few minutes- We got a Nest! Over time this little guy will learn our temperature habits, lower our electric bill, and allow us to control it from our phones or iPads anywhere (which is the coolest part). This was entirely Mr. Heatherland’s doing. If it were up to me, we would have a complex system of space heaters and heat blankets to get us through the winter. But because of him this house is chock full of fancy-pants radiators and now a new wifi thermostat. The installation was super easy and I jumped on the chance to get this nest set up. Wires get labeled and clipped in place. The face plate is snapped in place. Then I obsessively patch the holes. Connecting to our network took much longer than it should have. Since we have the longest wifi password in the history of passwords, and I got it wrong about five times. Spinning the nest dial around like a cat burglar cracking a safe lost it’s novelty very quickly. But it’s finally on. You wanna know the best part? It’s so pretty! Totally fits in with our decor. 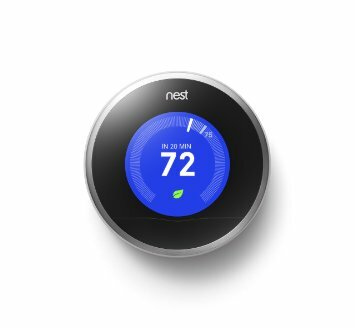 Good job, Nest! 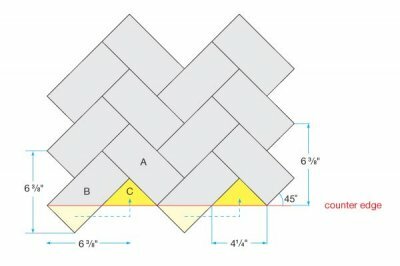 I have no words for this, all I know is that I’ve been dying to get my hands on this project ever since we bought the house, but alas I’ve had to wait. But the day finally came that I could ask Mr. Heatherland to rip it all apart for me. Which I have started to learn that he will do any chore I ask, very willingly, if it involves a sledge hammer. Within minutes he had the whole thing taken apart. 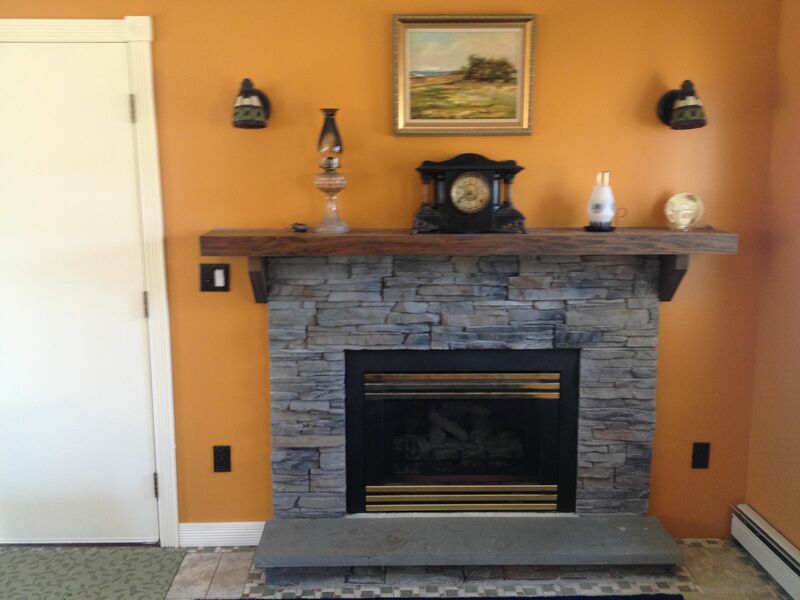 Anyway, the plan was this: once the awful stone facade was ripped away, I wanted to do marble tile flush with the face of the fireplace, with no hearth. 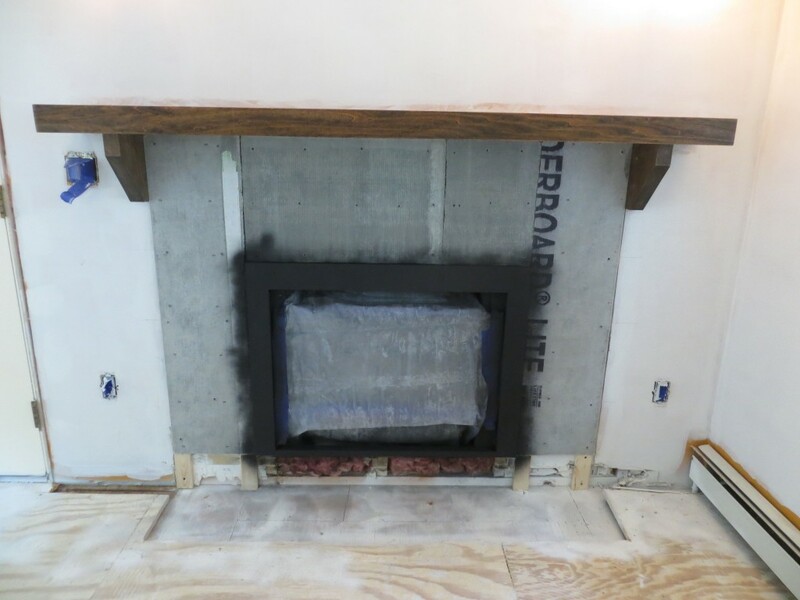 The mantle would get painted white to match the trim we’ve put through the house, and the fireplace grate will get painted a flat black. And this time I was really going to stick to our budget. Really, I was. Marble tiles usually run about $16 to $30 per sqft depending on what you’re actually buying. 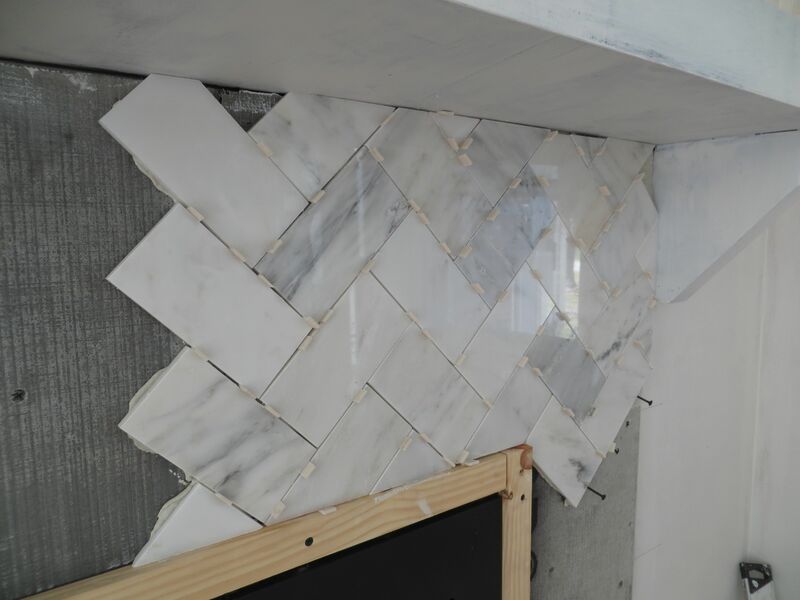 But wait, I had a trick up my sleeve…marble subway tile from Home Depot for about $5.69/sqft and I would arrange it in a Herringbone Pattern to give it a little more interest (while complicating my life). If you decided to ever go this route, let me warn you: The Home Depot stuff is in really rough shape. I sorted through a lot of boxes to pick out good ones, most of them are cracked, have excessive yellow veining, or crazy patterns. Once I found enough to work with I also got a box of plain white marble tile to add into the mix to brighten it up. 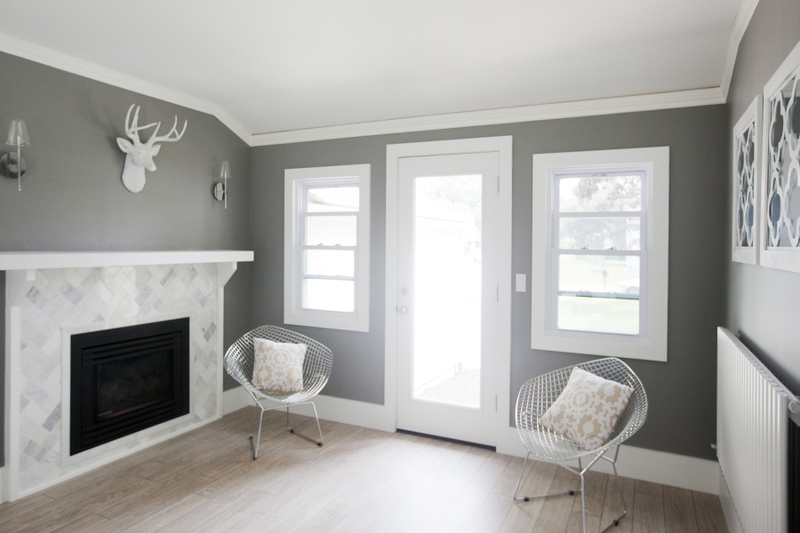 Along with 6 threshold pieces to frame the fireplace insert, the whole project came in at just under $100 which is drastically less than I had estimated (finally! under-budget!). Obviously it’s better (and easier) to start from the bottom…. I, of course, started from the top because the bottom still needed a little work and I could’t stand the idea of waiting. This ended up being a 3 day project that cost less that 100 bucks- well worth it! Oh yeah, and the Orange Room is no longer orange.